This antique style offering from the Dueber Watch Company is reminiscent of the antique American pocket watches produced in the late 1800's and early 1900's. 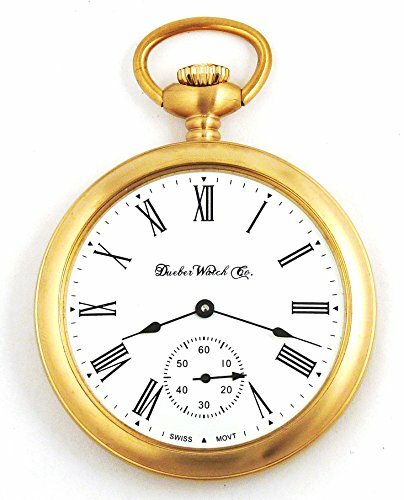 The large case is close to the size of the antique 16s size pocket watches from Ball Watch Co, Elgin, Hamilton, Hampden, Illinois and Waltham. It also features the highest quality Swiss mechanical watch movement on the market! This is the same 17 jewel movement used in many modern Bernex, Jean Marcel, modern Hamilton, Aerowatch, and most of the quality Swiss pocket watches today! If you are looking for an heirloom quality Swiss timekeeper to carry around and be serviceable for the foreseeable future, this is the watch for you! The Roman numeral dial design is based on antique Hamilton Watch Company Railroad dial! Dueber watches are built to last and are hand assembled in the USA!